Some people are always a bit skeptical, but for others this is taken to a whole new level. They find themselves always questioning their situation and are afraid that the other shoe is about to drop at any moment. 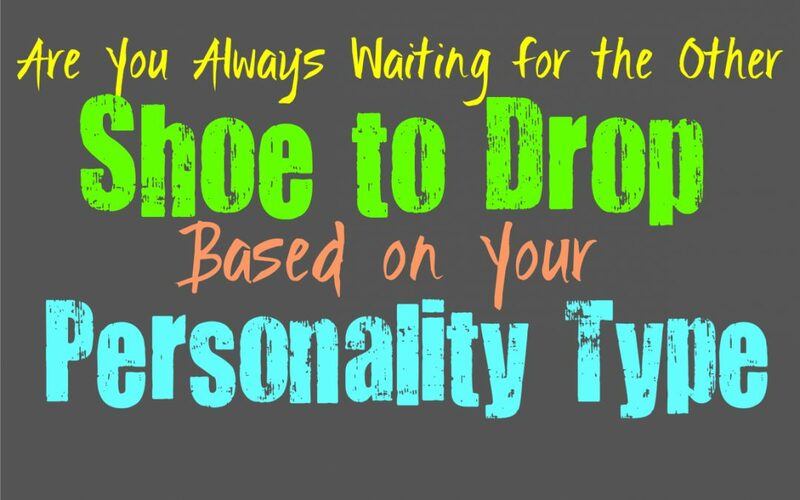 Here is how often you are waiting for the other shoe to drop or for something to go wrong, based on your personality type. INFJs can be a bit skeptical, and in the back of their minds they often find themselves questioning things around them. They realize that often when things seem too good to be true, they actually are. INFJs try not to allow negativity to weigh them down, but when they have experienced plenty of heartache they can start to struggle with trusting others or even themselves at times. INFJs are sometimes waiting for that other shoe to drop, especially when their intuition is telling them something isn’t quite what it seems on the surface. ENFJs don’t like simply waiting for the other shoe to drop, instead they strive to be prepared for when it happens. ENFJs can be skeptical of things and do sometimes have an intuitive sense when something might go wrong around them. Instead of simply waiting for that other shoe to drop, they do their best to prepare for what is to come. They want to work hard to avoid allowing mistakes to happen and instead do their best to be ready for anything. ENFJs don’t want to just wait it out, they use their dedication and intuition in order to ensure that their lives are the way they want. INFPs can be skeptical people, and sometimes their intuition drives them to feel a bit nervous about the future. Their minds analyze just about everything around them, and this can cause the INFP to expect the worst. They can sometimes find themselves waiting for the other shoe to drop, especially if something seems too good to be true. They try to avoid these negative emotions though, since it can leave them feeling afraid of the future and less positive about what is to come. ENFPs try not to allow negative emotions to take them over, but there are times when they can be a bit skeptical. The ENFP who has been hurt in the past, often waits for the other shoe to drop when they are in a happy relationship. When they find themselves really opening up and drawing close to someone, they can start to become fearful that things won’t work out as they hope. This can certainly cause the ENFP to pull back a bit and even sabotage the situation out of fear of getting hurt themselves. INTJs don’t like just sitting around waiting for the other shoe to drop, instead they would rather prepare for what might occur. They work hard to keep everything in order and always want to be ready for when things might go awry. Instead of just being fearful, INTJs want to be prepared and find ways to protect themselves against these situations where things fall apart a bit. They work hard to avoid negative situations and always want to be prepared for the negative side of life instead of simply allowing it to happen. ENTJs do realize that things can go wrong, but they don’t just wait around for it to happen. They are focused people who believe in analyzing their situation and finding ways to prepare for any possible outcome. ENTJs are fully aware that the other shoe certainly might drop, but they don’t just believe in allowing this to happen. They want to be ready for the future and anything that might come at them, so they simply strive to prepare themselves for these situations the best they can. INTPs are often very skeptical people, and so in the back of their minds they are often waiting for things to go wrong. They have a knack for analyzing situations and seeing the many different potential outcomes. This helps the INTP see where things can fail, and so they are often waiting for this to happen. While INTPs are almost always waiting for the other shoe to drop, they try their best to figure out the best way to avoid this. It can cause them to be untrusting and so they might struggle to really open up to most people. ENTPs are certainly skeptical people, since they have a knack for seeing different possibilities before them. The way their minds can analyze a situation and see how things might go wrong, is certainly a skill but it can be a bit stressful for them at times. ENTPs can see these different paths and how they might cause problems down the line, but they try not to let this hold them back. Instead the ENTP simply wants to do their best to learn from the situation and move forward towards the future that feels right for them. ISTJs are definitely focused on being prepared and this can come from a fear that things can go wrong. They do sometimes fear the other shoe dropping in their lives, but they don’t want to let that fear overtake them. Instead ISTJs believe in being prepared for the future and anything that might go wrong in their lives. They work hard to be ready for what might occur instead of just waiting for their lives to fall apart. ISTJs are focused people who believe that as long as they work hard they will be able to accomplish their goals and navigate any struggles. ESTJs do sometimes struggle to trust others and so they sometimes hold this idea in the back of their minds that things could go wrong. Because of this ESTJs strive to be prepared instead of just being fearful of what might happen. They don’t like allowing their fears or doubts to hold them back, instead they simply strive to be efficient and get things done. They often believe that as long as they work hard they will be capable of getting ahead in life and overcoming whatever struggles might come their way. ISFJs don’t like simply waiting for the other shoe to drop, instead they want to focus on taking care of themselves and their loved ones. They realize that things can sometimes go wrong, they just want to protect their loved ones and make them happy. Sometimes this means the ISFJ needs to be ready for how things might not work out, so that they can navigate this situation. They work hard to keep moving forward and just get things done to the best of their ability. ESFJs don’t often find themselves waiting for the other shoe to drop, instead they just try to get things done right. They care about protecting their loved ones and tending to their needs as best they can. ESFJs realize that things can go wrong, and sometimes this does leave them feeling a bit anxious. They know that there is plenty that can stand in their way but they simply work hard to avoid these mistakes and make sure their loved ones are happy and cared for. ISTPs might be skeptical people but they don’t like constantly waiting for the other shoe to drop. They realize that things might go wrong but they simply want to cross that bridge when they get to it. For the ISTP it is best to simply enjoy their surroundings and try to make the most out of their present. They aren’t foolish enough to expect things to constantly be positive in their lives, but that doesn’t mean they are going to be constantly worried about what might happen down the line. ESTPs can become a bit high strung when they are trying to take care of a lot of things in their lives. While they have moments of skepticism and doubt, that doesn’t mean they are constantly on edge about it. ESTPs might have doubts in their back of their minds, but mostly they just focus on living in the present. They don’t obsess over the future and what might go wrong, they simply look at what is occurring around them and how they ca make their present better. ISFPs don’t like stressing about the future or what might go wrong, instead they want to live in the present. They strive to seek out the things which bring them joy and inspire them the most in life. For the ISFP waiting for the other shoe to drop is just not something that comes naturally for them, and really isn’t what they are about. They want to focus on the beauty in the world instead of constantly seeing the pain and negativity which might ensue. ESFPs definitely don’t have this fear of things going wrong, mostly because they live in the present. Waiting for the other shoe to drop comes from being constantly afraid of the future, and ESFPs simply aren’t this way. They focus on the world around them and try to absorb plenty of joy and happiness in the moment. For the ESFP it is simply draining to always be afraid of how things might go wrong, and this just isn’t how they live their lives.